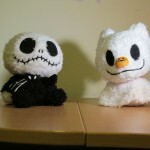 I own a few plush Nightmare Before Christmas characters but these guys are absolutely adorable! How can you look at them and not think “Awwww… how cute?” But I’m a girl so it’s okay for me to say that. 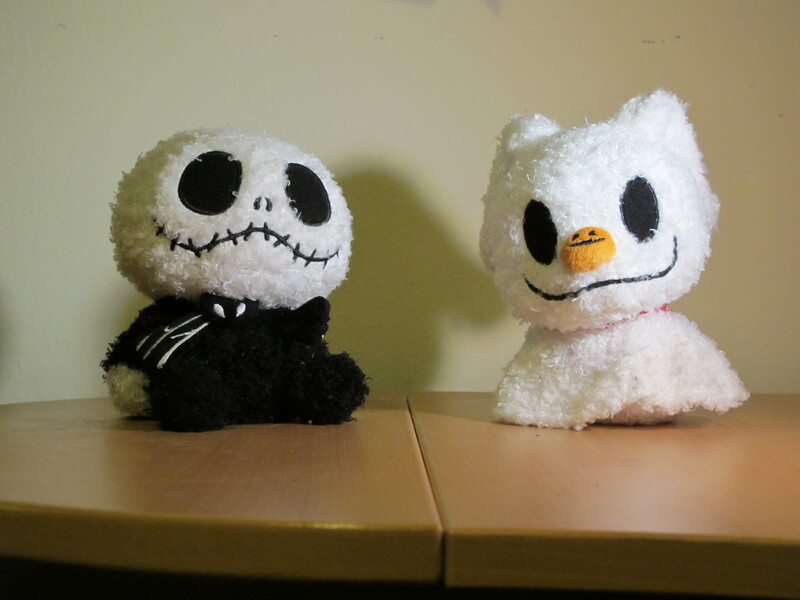 I bought these super soft toys recently at Disneyland for $18 each. They sit about 7 inches high. They have a wooly appearance and have heavier bottoms so they can sit up right. Jack is wearing a cape. As you can see from the photo, they have small bodies and big heads. I think I should keep them around my desk so when I have a not-so-good day at work, they can be there to brighten my day. The stuffed animal version of bobble heads. They’re absolutely adorable indeed. I also couldn’t resist to buy both of them on my recent trip to Disneyland. I actually found one of these at the store I work at. It was obviously a child’s who took it every where from how dirty and ripped it was. But I almost squealed when I saw it. I have loved this movie since I was a child and know every word. Do you happen to know if they also sell them at DisneyWorld? I’ve been numerous times and will be going in the near future and I want to make sure to get one of each. I’m not sure. I know they still sell them at Disneyland though. Hi, they do sell these at Disneyworld – I went there this August and they were in the plush section of Once Upon a Toy in Downtown Disney. Yes they do! I got both of these at Disney World. dod you know if i can buy these online anywhere? i saw them when i visited disneyland a few months ago, but decided on buying something else instead. i’ve been pining for the dolls ever since. I hadn’t seen one as those were the only two sold at Disneyland. It is surprising they hadn’t made one of her! Can I buy these online anywhere?! I would have to look but probably disnyeland.com’s store.